In April members organized a fete where we had lots of different stalls. We raised £422. We wanted to donate half the proceeds to charity. The charity we chose was the Welsh Air Ambulance Service. 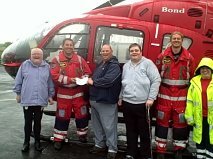 This is a photo of us donating a cheque for £200. We had a lovely day, we got to meet the paramedics who told us all about the hard work they do. We also had a look around the airport and they showed us the helicopter. It was great to donate money to help others.